Anti-wrinkle injections can be given to eliminate wrinkles, crow’s feet, frown lines, smoker’s lines, ‘pebbly’ chin and nose bridges (bunny lines). Anti-wrinkle injections contain a neurotoxin that relaxes the small facial muscles below the skin, causing lines and wrinkles to disappear. Dr Feldman offers anti-wrinkle injection treatments in her clinics in South Yarra, Melbourne (near Toorak, Prahan, Windsor and Richmond) and Perth. Dr Joni Feldman was one of the first cosmetic surgeons to use anti-wrinkle injections in Australia, having used them regularly in her Double Bay, Sydney clinic since 1991. Through the course of her career, she has administered over 10,000 injections. Highly meticulous, she has a huge following of devoted clients due to her precision, artistic eye and natural-looking results. Anti-wrinkle injections take very little time to administer – usually less than 20 minutes, with results lasting for anywhere up to approximately six months. The procedure can also be used in conjunction with dermal fillers to help treat both dynamic and static wrinkles. How do anti-wrinkle injections actually treat wrinkles? Are there any neurotoxin side-effects? Can I still make facial expressions? Where is the anti-wrinkle treatment most commonly injected? What else is this substance used for? How long does the antiwrinkle injection treatment last? Anti-wrinkle injections are made of a chemical neurotoxin produced by a particular bacteria. This bacteria, it’s organic state, can result in serious, life-threatening paralysis. However, for purposes of injection, the neurotoxin is purified, enabling it to be used as safe, injectable medicine. It is safe to use as medicine as it is used in very small quantities and injected directly into specific areas. Anti-wrinkle injections treat wrinkles formed by facial muscle contractions. The injectable substance, a safe injectable neurotoxin, stops the impulse from the nerve to the muscle, inhibiting the muscle from contracting and therefore forming wrinkles. A common example is the use of anti-wrinkle injections to relax the frown muscles, preventing the appearance of the vertical frown line. It is also often used around the corners of the eyes to prevent crow’s feet. If static lines have been visible on the face for some time, anti-wrinkle injections will not immediately erase these lines (in other words, lines that are visible when the face is at rest). To treat facial lines that are visible at rest, dermal fillers are recommended. Alternatively, your doctor may recommend skin resurfacing. Another benefit of regular anti-wrinkle injections is that due to the muscles relaxing, the skin on top has a chance to heal, visibly reducing the appearance of wrinkles, along with preventing more permanent ‘etching’ of wrinkles in the future. You may like to think of it as a type of insurance against wrinkles! Botulinum toxin injections temporarily paralyse particular facial muscles that pull or contract your skin, causing wrinkles. They allow the skin, once injected, to flatten out. Because anti-wrinkle treatments only target specific, individual muscles you will be able to form most facial expressions without constriction. Potential side-effects for the antiwrinkle treatment are small. There can be very mild swelling or temporary redness, which usually disappears in less than an hour. Occasionally a small amount of bruising can appear, which may last a few days to a week. Very rarely a condition called ptosis, or ‘droopy eyelid’ can appear and can last for up to one month. Fortunately, there are medical eyedrops to temporary reverse this condition. 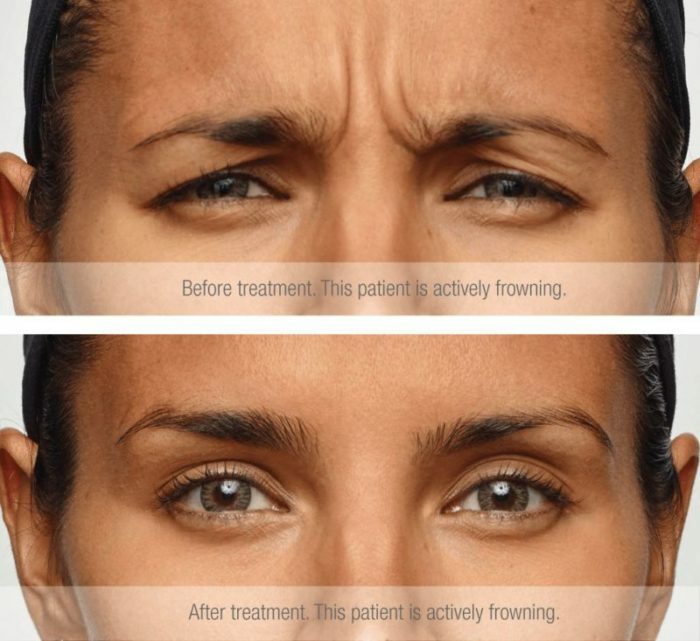 You will have positive visible results from botulinum toxin, but your facial appearance will not drastically change or look as if you’ve “had work done.” Particular muscles that cause frown lines will simply become less active, however you will still be able to pull facial expressions and appear natural-looking and normal. Anti-wrinkle injections, when administered by a medical professional trained in thhis area, is relatively safe. There are some side effects associated with the use of neurotoxin injections, as there are with all treatments although most of these are temporary and very mild. 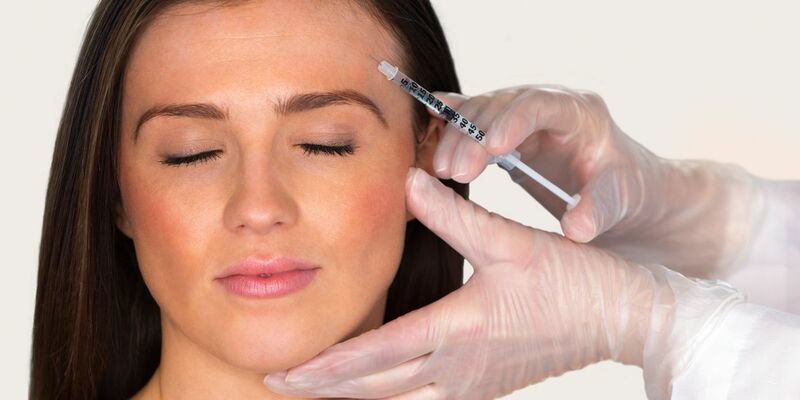 There can be some discomfort with injections, but these can be greatly minimised by the use of either a cold pack applied prior to the treatment or applying a topical anaesthetic cream. The entire procedure is extremely brief, with most patients being in an out the door within five minutes with no downtime required. Cheek – to contour or reduce a square cheek, often performed on Asian faces. The (safe) neurotoxin in these anti-wrinkle injections are is also used to treat axillary hyperhidrosis, or excessive sweating of the armpits. This is a condition that affects approximately 1% of the population and does not respond to the use of antiperspirants. The substance is injected into the nerves that control your sweat glands to inhibit activity, vastly reducing the amount of sweat produced under the armpits. Anti-wrinkle injection treatments can last up to 4 to 6 months. Results vary between individuals.